You see, in high school, I had a crush on my Chorus teacher. He was a young guy, and he had gone to college with some cousins of mine, and over the summer between 9th and 10th grade, we ran into each other at a series of pre-wedding parties, and I fell DEEPLY in like. You? 1) Did you ever have a crush on a teacher? I've always crushed on teachers and professors. In 1st grade I crushed on my teacher, Mrs. Fry. I absolutely loved her and everything about her. In 6th thru 8th grades I crushed on her brother Mr. Fry (no joke! it's a small world, especially in KS) as we learned history from him. In high school I developed a major crush on Mr. Pappas who taught Psychology. Then my freshman year of college I heavily crushed on my English professor--Mark. I shared my poetry with him and he took an interest in my writing. We went to dinner a few times and talked about writing, he took me under his wing. I thought it was more but I was so wrong. We stayed in contact for a few years. I still get excited when I see one of his books for sale. Sometimes I think it would be hilarious to tell him that I'm a pastor now--if he would remember me. 2) Who was your first crush? 3) Have you ever given a gift to a crush? Yeah, Shawn Hamlin--8th grade. I brought a helium balloon that said, "Somebunny Loves You," and tied it to his locker. It was awful, he was embarrassed and therefore really mean about the whole thing. Looking back I understand, but it sure sucked back then! Dr. Calliope Torres from Grey's Anatomy! This year she has further endeared herself to me. I so totally love her! And she is a total hottie! 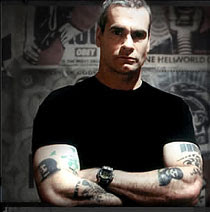 There is also my long standing crush on Henry Rollins who I recently discovered plays on Sons of Anarchy! I'm so glad to see him, even if it is without his tattoos! I also gave him daisies at one of his spoken word events! 5) Have you ever been surprised to find yourself the crushee? Eek. Middle school can be rough. I don't know your male crush, but he's cute! I love hearing about your teachers--the sister and brother in particular. Cool. Very open are you to discuss it--I thought only a few people had these things. What a way to find out we are all a bit more normal than we thought. Smile.